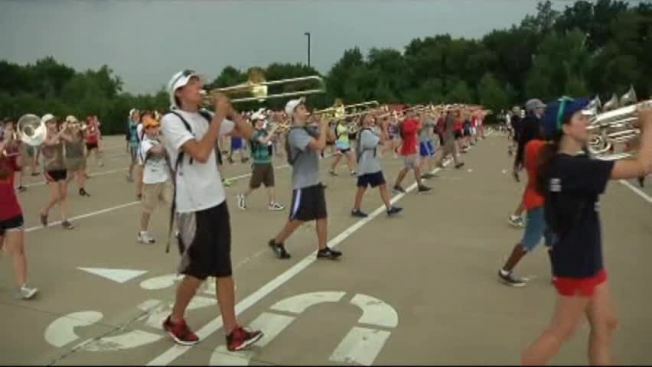 The McKinney Boyd High School Bronco band like so many others across North Texas, contend with all types of weather, especially triple digit heat. "We've been up to 100 degrees-102 degrees before we head inside," said band director Derek Stoughton. "It's pretty intense." However on this particular day, storm clouds looming overhead provide some much needed relief. "We just make sure that we give them plenty of opportunities to rest and to hydrate so we can maximize our time out here," Stoughton said. The band starts practice at 7:00 a.m., when temperatures are a bit cooler. As the mercury rises, the band heads inside where there's always popslices waiting for them. "A couple of them have told me that they would die without the popslices -- a little overdramatic -- I think they really look forward it," Malia Yancey, a band volunteer said. For a marching band that's resilient to Texas heat. "The heat doesn't bother us, it's all worth it, we will fight because the product in the end will be worth it," Stoughton said. The band will host its annual drum-a-thon Saturday from 6:00 a.m. to midnight to raise money for new equipment.